Below is a story about the Graphic Novel class that originally ran on June 7, 2011. MOUNT PLEASANT — Whether it’s Superman, Batman, Peanuts or Marmaduke, we all have our favorite comics. Many of us can’t imagine what it takes to create an original comic, but others, like MMCC student Matt Miller, have been thinking about it their whole lives. Miller, 26, of Alma, grew up drawing Ninja Turtles. Today the graphic design major dreams of publishing his own graphic novel. To start him on his path, he spent his Friday afternoons this past semester taking ART 206: Comic Book and Graphic Novel Illustration taught by Brad Olrich of Clare. Miller was excited to learn that MMCC offered a class in comic book illustration and is surprised at how much he has already learned. Olrich, who also teaches Drawing I and Illustration at MMCC, shares his experience as a graphic novelist with his students. He writes and illustrates his own graphic novels Commodore Dinosaur (online at commodoredinosaur.com) and the not yet released Castor and the Vandals, which will be available on Kindle. The upcoming novel is written in the style of the adventure books he read as a child combined with ancient history. Olrich finds that many of the students have had their story ideas for a long time, but are unsure of how to put the pieces together. He stresses that there is more to it than just illustrating the artwork. Students in the class are required to write and illustrate a chapter of their own graphic novel. At the end of the semester they will be published together in the fourth edition of Mid-Riff. Olrich has arranged for current students and the fourth edition of Mid-Riff to have a table at Cherry Capital Con in Traverse City on June 25-26. The website, cherrycapitalcon.com, bills the event as “Northern Michigan’s largest comic book and pop entertainment expo.” The second and third issues of Mid-Riff are available at both MMCC bookstores. The second issue is also available at Hall of Heroes in Mount Pleasant. The first issue is out of print. 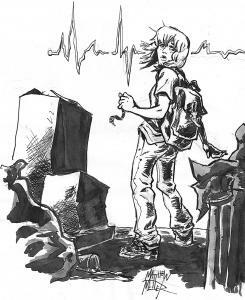 Miller’s story, “Beat,” is about a little girl who gets a heart transplant. The donor turned out to be a superhero and the little girl ends up with the superhero’s powers. The inspiration for the story came from a neighbor who got a kidney transplant. Miller’s sister came up with the idea of a superhero and they talked about the idea for more than a year. Drawing from “Beat” by Matt Miller. Talking about his students’ success, Olrich shares how impressed he is with Miller. “I want to put him in a container and send him off to Disney and tell them to put this guy to work. His stuff is just phenomenal,” Olrich said with a grin. Miller knows what he wants in his future.